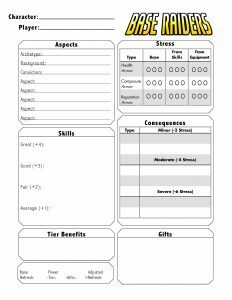 Kat from Rollplay Studios revised the Base Raiders character sheet to make it look a bit more polished. It has better aligned text and some more lines to separate sections more effectively. Great! One thing I specifically geek out about in RPGs is good character sheet design.